During the weekend my partner and I love to laze about, eating and drinking. If we can do all those things whilst sitting by a nice calm lake with a few duckies we are in a happy place. Luckily the new neighborhood that we recently moved to a few months ago has a big lake at it’s center. We love it! 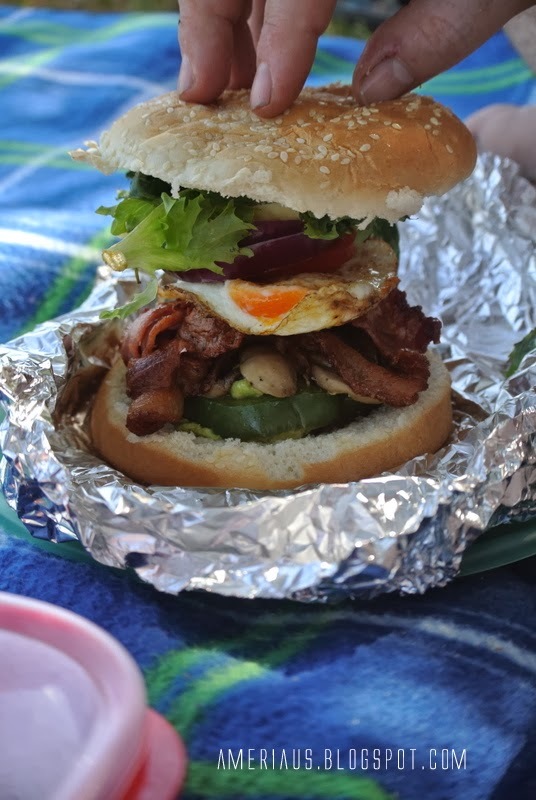 This weekend we packed up the picnic blanket and some Bacon & Fried Egg Cheeseburgers and headed out! My partner was very happy when I told him what I would be making for our lunch. He loves a good burger and let me tell you these burgers were STACKED. Check it out for yourself ! If you would like to bring along sauces but you don’t want to bring the big bottles and then risk them going off... simply take a zip lock bag pour as much of the sauce as you think you will need into it and zip it up. Put it into your cooler bag. When time comes to use the sauce just tear a whole in the corner of the bag. And like magic you have your own squeezable sauce bag! Today is Big City BBQ here in Brisbane so Ill be heading off soon to join the festivities for a really good cause !